I wanted to have a finished machine that was pleasing to the eye, and looked like it belonged in the house, and not in the garage. I’ve chosen to build the main structure out of red oak, for it’s strength and appearance, and the fact that it was readily available. 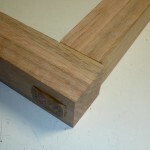 Woodworking is not my strength, so construction was slow & difficult. 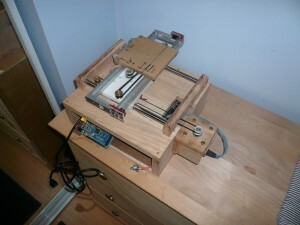 The main base of the machine is a box, which will contain the power supply and electronics. To keep the cost under control, I’ve used mostly materials that I already had, only the wood and a few electronic parts were purchased specifically for this project. In terms of functionality, I’ve attempted to make everything I can adjustable, to allow for small adjustments during the “dialing it in” process that I’ll do once it’s “done”. Construction is not finished, but is to the point where I have working X, Y and Z axes. 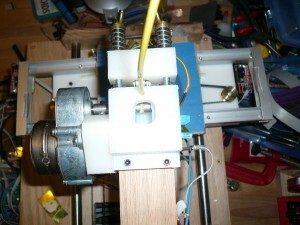 The remaining work is mostly centered around the plastic extrusion head, and software setup. 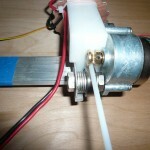 The extrusion head is a fairly touchy system, and seems to be the area where most people have to do a lot of fine tuning before getting the results they’re after. 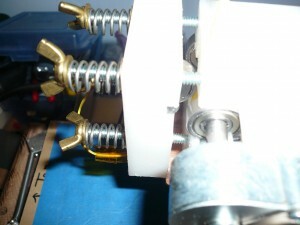 The extrusion head also has the biggest impact on output speed and the finish quality of printed parts. 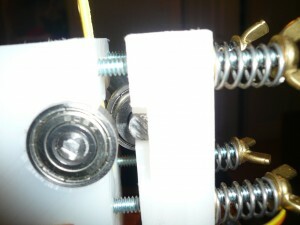 I am currently on the second revision of the extruder head, my first try had problems gripping the feedstock. First try at extrusion feeder, it failed. My 3 axes are using 3 different bearing mechanisms, the “X” axis is oil-impregnated bronze bushings and teflon plastic, sliding on two steel rods. 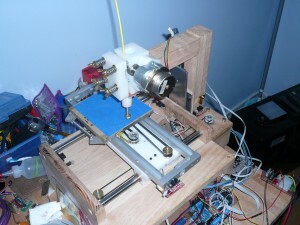 X axis rails and Y axis motor. The “Y” axis is a McWire type sliding carriage that slides on aluminum channel stock, stabilized by bearings. The bearings for the “Y” are salvaged from DLT computer backup tapes that were decommissioned at work. (protip: Cutting the whole tape in half with a Sawzall is an effective data destruction method). 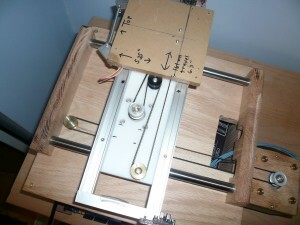 The “Z” axis is sliding on a commercially made linear bearing rail/carriage that I’d got on eBay some time ago. There is only a single “Z” linear bearing, but since the forces it will have to withstand are pretty low, it’s rigid enough. A machine that endured greater forces, like a milling machine, would require more strength in the Z axis. 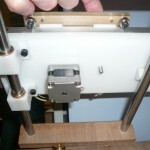 Z axis support arm, moritse & tennon joint. The “X” and “Y” axes are driven by 1.8 degree stepper motors with pulleys and belts, this allows for very rapid movements. 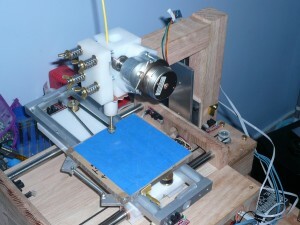 The “Z” axis is driven by a 12-TPI acme screw, which is much slower, but provides the greater torque required to lift the weight of the extruder head and it’s support-arm. The “Z” stepper motor has 7.5 degree steps, into a 15:1 gearbox, which lets me use a much smaller motor and motor driver than would otherwise be needed. The “X” and “Y” stepper motor drivers are Centent CN0142 drivers, and the “Z” and extruder-feed drivers are EasyDriver boards. The electronics are all driven by an Arduino Mega, using a fork of the RepRap 5D Firmware, although I may evaluate other firmware code. zig-zagged Y belt, to increase belt grip. Some detail pictures of the exturder body.